Following are our SMP Adapters. 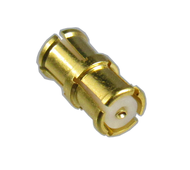 These smp adapters aka gilbert gpo™ adapters allow interconnects to sma, smp, 2.4mm and 2.92mm. The SMP is a push together connector, allowing for tight interconnects, and very broadband operation due to its high cutoff frequency. 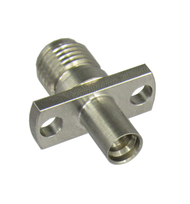 SMP connectors are rated to 40ghz, often the limiting factor with these adapters is the other connector; so our SMP to SMA adapters are rated to 27gHz. 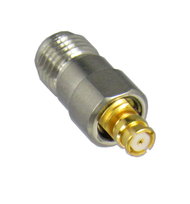 While the majority of applications we see use sma to smp adapters, smp to 2.92mm and smp to 2.4mm adapters find use at the higher frequencies. The male smp comes in varing Detentes, which determine the mate/unmate force; full detente, limited detente,smooth bore; so our smp adapters also have these options.